We aim to inform landowners about Bank Swallow (Riparia riparia) ecology on the Sacramento River. As a protected species, there are incentive programs and technical assistance available to help landowners who want to protect riparian habitat, which includes Bank Swallow habitat. Bank Swallows are a California “threatened” species under the California Endangered Species Act and federally protected by the Migratory Bird Treaty Act. The Bank Swallow population on the Sacramento River has declined since original surveys were conducted in 1985, by about 40% at the lowest count. 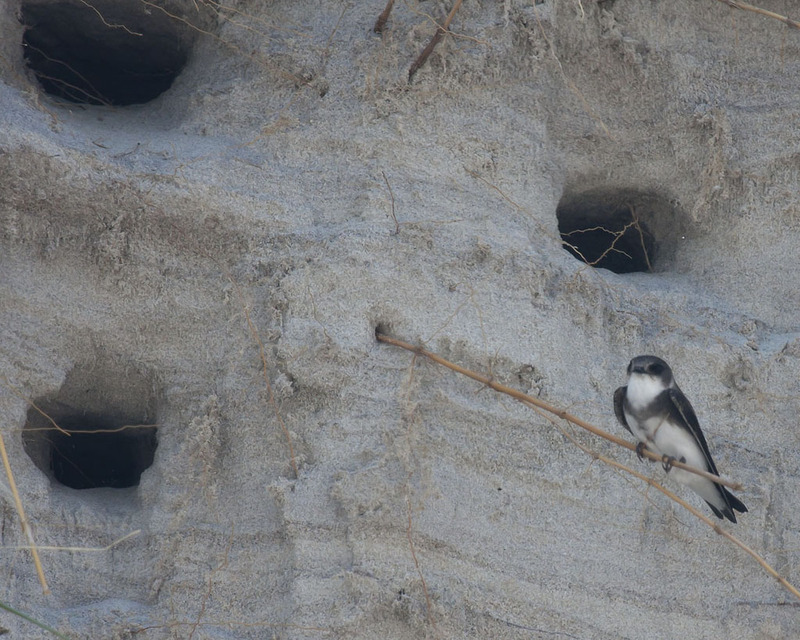 Because the Bank Swallow excavates burrows into river banks to nest and raise young, the main reasons for its population decline are measures that halt or decrease bank erosion. These include bank stabilization measures such as staging or applying rock (rubble or riprap) and constructing spur dikes. 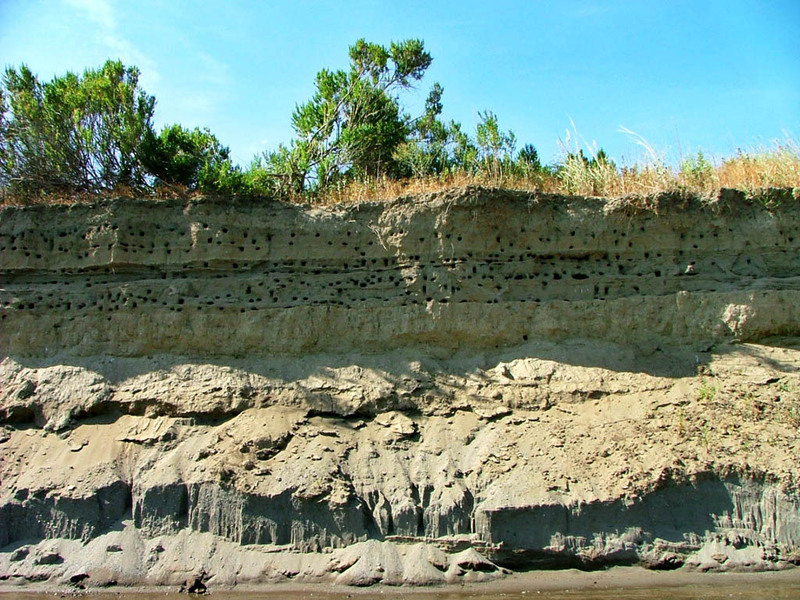 Riprap applied to exposed banks by the Army Corps of Engineers, Department of Water Resources, and private property owners has armored approximately 50% of erodable bank in the Bank Swallow breeding area from Red Bluff to Colusa on the Sacramento River. Currently, State and federal stabilization projects are being assessed for need, and alternative measures to rock are being evaluated to help protect Bank Swallow habitat. Incentive programs exist that encourage landowners to protect Bank Swallow nesting habitat on private lands. There are six species of swallows that might occur on the Sacramento River. There is only one other species of swallow that has similar nesting habits and appearance that may be confused with the Bank Swallow. The following field marks and behavior tips will help landowners determine if Bank Swallows are using their property. Brown back and white underparts. They have a distinct brown breast band (which may be difficult to see on birds in flight) contrasting with the white chin and belly. Excavates nesting burrows in river and stream banks, coastal bluffs, sand and gravel pits, and road cuts. Highly colonial nester,excavating tens to thousands of burrows in a bank. Aerial foragers eating flying insects over fields, wetlands, agricultural lands, and other insect-rich habitats. Spends five to six months on the Sacramento River to breed and raise young from April through August. Bank Swallows then depart for their wintering grounds in Mexico and South America. Therefore the swallows will not be present on the Sacramento River most of the year. The Bank Swallow can be confused with the Northern Rough-winged Swallow(Stelgidopteryx serripennis), which is similar in appearance and has similar nesting habits. The Northern Rough-winged Swallow does not have the brown breast band. It rarely excavates its own burrows but takes advantage of old Bank Swallow burrows and crevices in banks. Northern Rough-winged Swallows nest singly or in small groups, usually fewer than 10 pairs nest together. Often tall, vertical, freshly eroded bank surfaces (cut banks). The presence of numerous burrows, old or new. Variable overstory vegetation: grassland, orchard, riparian, and fallow lands. The Bank Swallow is a highly colonial, neotropical migratory bird breeding in northern latitudes and wintering in southern latitudes. For example, our California breeding population winters in South America and nests in the northern part of the State. 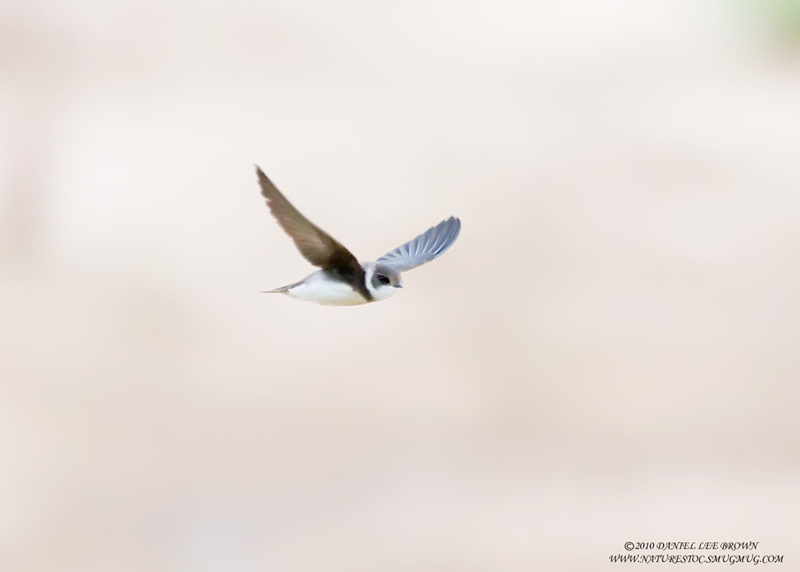 The Sacramento River birds arrive from their southern wintering grounds in early April to scout the river banks for suitable nesting surfaces, excavate nesting burrows, find a mate, and raise young before leaving in August to fly to their wintering grounds. If luck and experience prevail, this cycle will continue for individuals for many years - the oldest documented Bank Swallow was 8 years old (USGS 2010). For breeding habitat on the Sacramento and other rivers, the Bank Swallows require natural river processes to create newly eroded bank surfaces to allow them to excavate their nesting burrows each summer. Because winter storms and floods often scour the banks, removing old burrows, the birds exhibit only moderate site fidelity to their previous burrow sites on the nesting ground. In low flow years, some burrows remain from the previous years and the swallows will reuse them if they are not too infested with parasites or degraded to allow predator access. Therefore, all swallow habitat along the river is valuable, whether it be intact burrows from the previous year or recently eroded banks available for new excavation. 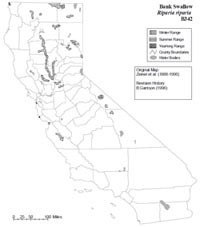 The Sacramento River can be considered as four different reaches or lengths of river based on distinct features including geology and soil composition, vegetation, channel meander, and land-use (Sacramento River Conservation Area Forum 2003). 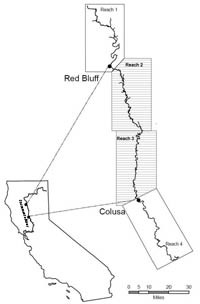 The 100-mile river reach from Red Bluff to Colusa is divided into two 50-mile reaches; Reach 2 (Red Bluff to Chico Landing) and Reach 3 (Chico Landing to Colusa), shown as the shaded area on the map. These two reaches have been identified to support the most valuable habitat for Bank Swallows. It is along the river banks of Reach 2 and 3 that approximately 70 percent of the entire California Bank Swallow population breeds. Listed in 1989 as a California State threatened species due to extirpation from southern and central California resulting in a very limited range. 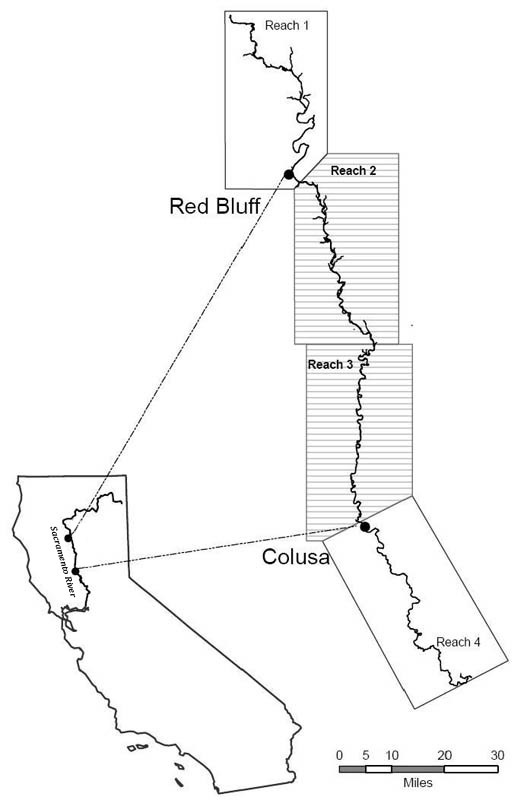 The majority of the California population nests along the Sacramento River within Reach 2 and 3, the stretch of river from Red Bluff to Colusa. 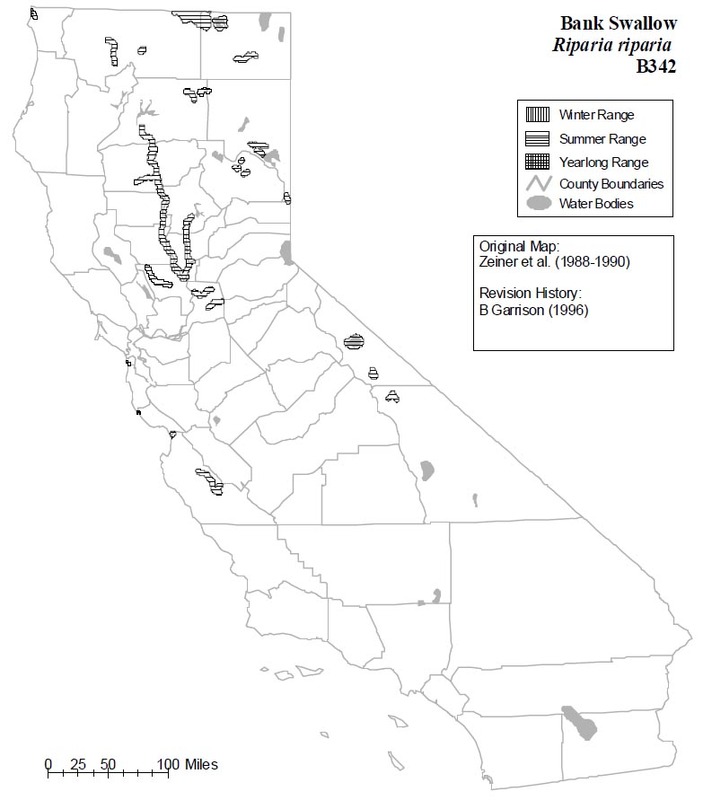 Reaches 1 and 4 and the Feather River also provide nesting habitat (see range map). For web-based CDFG information about the Bank Swallow status, more specific range map and life history account go here. The following programs are provided by organizations and agencies offering incentives to landowners who want to protect and/or restore riparian habitat on their property. Incentives may come in the form of one or more of the following: acquisitions, tax incentives and/or technical assistance. Each program has specific requirements and many have application deadlines. Each property may qualify for none, one, or more of the programs. Property owners should contact the organizations below to determine if their property is eligible for specific programs. The Partners for Fish and Wildlife Program is the U.S. Fish and Wildlife Service's habitat restoration cost-sharing program for private landowners. The program was established to provide technical and financial assistance to conservation minded private landowners who wish to restore fish and wildlife habitat on their land. The Wildlife Habitat Incentive Program (WHIP) is administered by the Natural Resources Conservation Service (NRCS) and authorized by the 2002 Farm Bill. This program provides technical and cost share assistance for California landowners who wish to enhance fish and wildlife habitat that have been impacted by agricultural activities. The WCB has many programs to assist landowners interested in protecting habitat and species, including tax incentives. Relevant programs for Sacramento River properties include ERAL (Ecosystems Restoration on Agricultural Lands) which assists farmers in integrating agricultural activities with wildlife habitat restoration and the California Riparian Habitat Conservation Program. Visit the website to see all program goals and objectives. $38.4 million has been approved to fund WCB projects (May 2010). This funding source is provided for landowners with properties or projects that can provide flood risk reduction measures, such as providing a flood easement or building setback levees. Neighbors cannot be adversely impacted but could be engaged to create a larger project. The second component is habitat restoration/conservation or agricultural land conservation. Funding is intended for acquisition, restoration, enhancement and/or protection of property while preserving agriculture and enhancing wildlife habitat. The NCRLT serves Butte, Tehama and Glenn counties in providing land acquisitions and tax incentive programs. These programs include the Farmland Protection Program, Rangeland Protection Program, Wildland Protection Programand Land Mitigation Program. TNC generally purchases and/or manages lands for conservation purposes. Properties must have qualifying characteristics such as size, connectivity to adjacent conservation lands, presence of listed species and/or high biodiversity, etc.